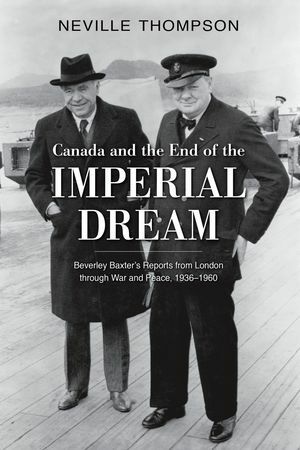 In February, OUP Canada published Professor Neville Thompson’s Canada and the End of the Imperial Dream: Beverley Baxter’s Reports from London. From 1936 to 1960, Toronto-born British MP Beverley Baxter reported on events in Britain in a column in Maclean’s, Canada’s weekly news magazine. Baxter’s columns were an important source of information about Britain at a time when most English-speaking Canadians still strongly identified with the mother country. Baxter was well positioned to write about British politics, as he wasn’t just an MP– he was close to Lord Beaverbrook and knew Churchill. Baxter’s career in London and impact on Canadian perceptions of the UK are therefore important historical topics. The decision of Canada’s current government to revive symbols of the Empire/Commonwealth has also caused some Canadians to think about, and debate, the historical relationship between Canada and the United Kingdom. It is not surprising, therefore, that Thompson’s book has generated interest in the Canadian media. For instance, the Hill Times, a publication for political insiders in Ottawa, recently ran a story about it. On 10 May, The Times Literary Supplement published a favourable review of the book by Nathan Greenfield. Greenfield noted that Baxter’s columns assumed a fairly extensive knowledge of British history and literature on the part of his readers, “many of whom were in small towns and whistlestop villages across Canada.” Greenfield seems mildly astonished that there was a time when the average English-speaking Canadian could have been assumed to know who Pitt, Drake, and Dickens. Greenfield’s observation prompted a letter from a reader who recalled that British history and literature were once staples of the curriculum in one-schools in rural Canada. (I can’t include direct links to Greenfield’s piece and the letter it generated, thanks to the TLS paywall. However, this link will take you the login page). Tags: Neville Thompson’s Canada and the End of the Imperial Dream: Beverley Baxter's Reports from London.